Chop the top inch or two of the artichoke off, the stem (if any), then cut down the center and scoop out the hairy portion and innermost purple leaves. Chop potatoes in half and drizzle with olive oil, salt, pepper and garlic powder. 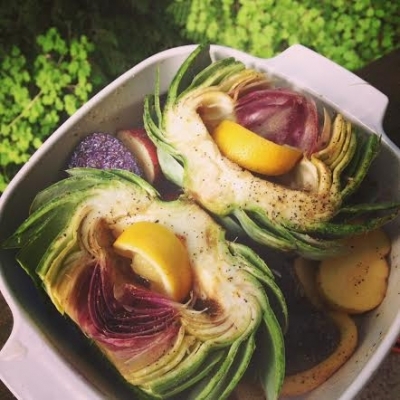 Place the potatoes in a cooking dish (that has a lid) and add the artichoke with olive oil and the same spices. Drizzle fresh lemon juice over the potatoes and artichoke. Cover with lid and bake for 45 minutes at 350. Artichoke heart should be nice and soft and potatoes easily pierced with fork!